Punta Mita has been described by Forbes Magazine as ‘the ultimate luxury travel destination.’ It was once a sleepy little fishing village, but today, Punta Mita is a dream come true for the more discerning traveler. With luxury gated homes and 5* resort hotels offering world-class service, not to mention highly rated golf courses, Punta Mita in Mexico is a top-tier destination. Whilst there are several luxury branded hotels with a presence in Punta Mita, there are also many luxury Punta Mita lodging options for families and groups. If you want the freedom to come and go as you please and the added attraction of more square-footage for your money, a luxury Punta Mita villa on the shore is hard to beat. 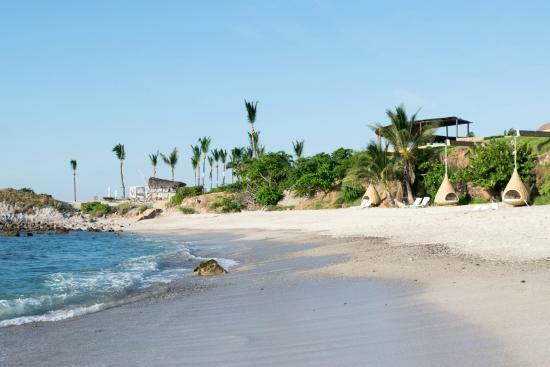 Punta Mita is popular with celebrities such as Gwyneth Paltrow and the Kardashian family, but you don’t need to be an A-lister to enjoy a vacation there. So, if all this talk about luxury has whetted your appetite, here is a guide to the top ten things to do in Punta Mita. The village of Punta Mita is surrounded on three sides by sparkling water and beautiful beaches. Many of the most luxurious villas are located on the west coast, while some of the gated estates are on the north coast. If you want to go celeb-spotting, head to the eastern peninsula, as this is where several celebrities own beachfront real estate. 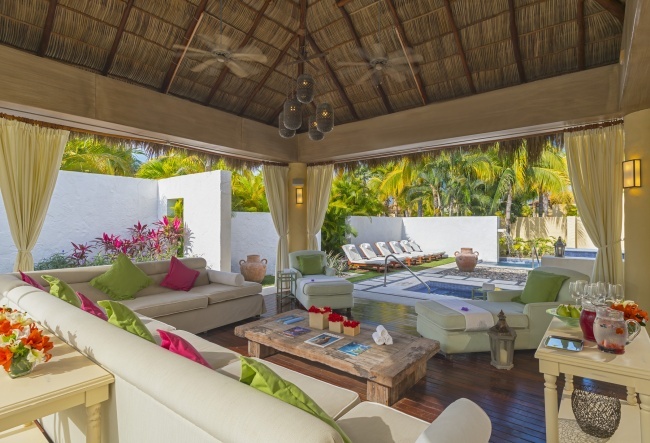 Naturally, their properties enjoy some amazing views over Banderas Bay. If you want a table with a view, head to the Tuna Blanca restaurant in Punta Mita. It’s ranked as the number one restaurant in Punta Mita. Serving a selection of Mexican dishes and seafood, Tuna Blanca has a lovely terrace with some of the best views in the area. You can watch out for Humpback whales while you tuck into a tasty meal. The beaches in Punta Mita are exceptional. This coast is rarely troubled by hurricanes, so the beaches remain pristine all year round. Punta Village sits on Banderas Beach. It is a paradise for sun worshippers and water sports enthusiasts alike. Bucerias Beach is a short 30-minute journey from Punta Mita. This five-mile stretch of stunning sand lies along Banderas Bay and is popular with local families. There are plenty of shells to collect, water sports to try, and if you want to try windsurfing, the conditions are ideal. Hidden Beach is also known as the Beach of Love, which makes it a great honeymoon destination. The beach, which is set inside a large crater, is only accessible by boat, but it’s well worth visiting. La Lancha Beach is also only accessible by boat, but it’s perfect for surfing. The waves here are always fierce enough to test your skills on a board. Punta Mita has excellent scuba diving opportunities. The air and water temperature are perfect for scuba diving all year round. Head out to the Marieta Islands on a boat charter and explore the caves and tunnels. The coral reefs are home to abundant marine life, including dolphins, sharks, and rays. El Morro is great for experienced divers. You dive up to 150 feet, go wall diving, and explore challenging caves and tunnels. Punta Mita is a great destination for keen fishing enthusiasts. The warm waters off-shore are teeming with marine life and there is no shortage of fish to catch. If you fish inshore, look out for grouper, snapper, and mahi-mahi. Book a fishing charter if you want to try deep sea fishing. The big game fishing season runs from June through to January, but the best catches are usually made in September and October. This is your opportunity to catch a marlin or sailfish. If you strike it lucky, you can take your catch home and grill it for a true ocean to table experience. For those who don’t catch much worth eating, don’t worry, the local restaurants are renowned for their excellent seafood menus. There are just as many places to go snorkeling, too. Anclote Beach is perfect for snorkeling. Rent equipment on the beach and go looking for shoals of brightly colored fish swimming in the warm waters. Bucerias Beach is also popular with snorkelers and scuba divers. Punta Mita has two world-class golf courses. Punta Mita Pacifico and Punta Mita Bahia are both Jack Nicklaus Signature golf courses. You can find them in Punta Mita Resorts. Unfortunately, they are only accessible to members or guests staying at the Four Seasons or St.Regis. Designed by Greg Norman, the Litibu Golf Course isn’t a beach side course, but it is just as challenging – and scenic. The Las Huertos Golf and Beach Club is perfect for casual golfers at all levels looking for a quick 9-hole challenge. The Remede Spa at the St. Regis resort was recently voted the best luxury spa in North America. If you need to relax and unwind, this is the place to go. Book a rejuvenating skin exfoliating treatment or try flotation therapy. There are customized spa treatments to suit your every need. It would be a shame to visit Punta Mita and ignore the local culture. The native Huichol Indians made Punta Mita their home thousands of years ago. They called the place a gateway to paradise, and it is not hard to see why. There are still several thousand Huichol Indians living in Punta Mita. Learn more about their culture, explore their history, and buy some of their artwork. Many of the local shops stock authentic fair-trade items made by local Huichol Indians. The Galeria Tanana in Sayulita is one of the best places to view art, textiles, and jewelry. Shopping for souvenirs is an essential part of any vacation. After all, family and friends will expect a few mementos of your trip! Whether you are shopping for designer clothing or locally-made gifts, you will be spoiled for choices in Punta Mita. There are several luxury boutiques in the lobbies of the top resort hotels, including the Four Seasons. Punta Mita also has a few small shopping plazas showcasing local goods and imported items. Pick up clothing designed and made by local designers or gourmet food for your luxury villa. There are also plenty of small beach shops selling cheap souvenirs for the kids. You can’t visit Punta Mita without sampling some of the local nightlife at least once. The resort hotels have their own entertainment, but if you want to rub shoulders with the locals, head over to the Kupuri Beach Club. Drink a few margaritas, watch the sun sink over the horizon, and listen to some excellent live music. If you are feeling brave, cut a few moves on the dance floor. For those who don’t have the moves, the local music scene provides plenty of options for an entertaining evening. Watch out for pop-up Latino music concerts and impromptu gatherings at restaurants. There is always something going on if you feel like being sociable. Visit Punta Mita this year and you won’t be disappointed. That’s a promise!